MediaHuman Music Converter is a software developed for conversion audio tracks to the most frequently used formats like MP3, OGG, WMA, WAV. This software is especially useful in case if you have tracks purchased music in online music store and you want to listen on Playback device, which doesn't support its format, like MP3 CD player, iPod/iPhone, Zune or other portable digital player, cell phone, Pocket PC, etc. If you want to listen music which you have purchased in online music store (Napster, Rhapsody or other) on your iPod then our software will help you. 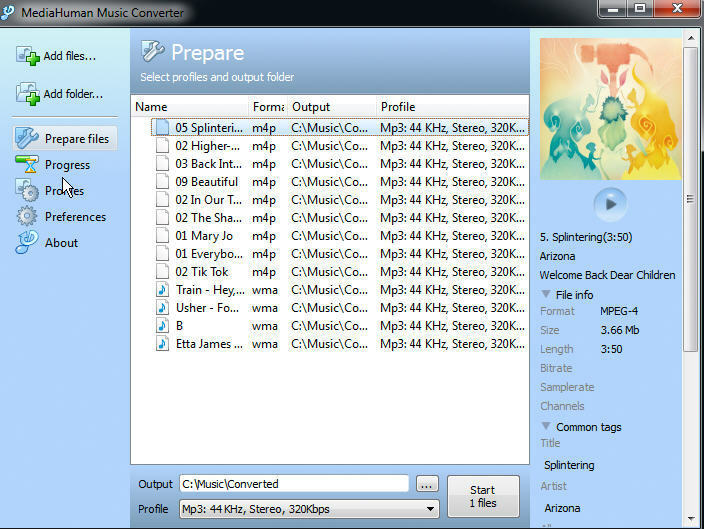 MediaHuman Music Converter supports conversion of purchased tracks which are playable in Windows Media Player or iTunes on your computer. Qweas is providing links to MediaHuman Music Converter 1.0.8 as a courtesy, and makes no representations regarding MediaHuman Music Converter or any other applications or any information related thereto. Any questions, complaints or claims regarding this application MediaHuman Music Converter 1.0.8 must be directed to the appropriate software vendor. You may click the publisher link of MediaHuman Music Converter on the top of this page to get more details about the vendor.